The Committee for a Better Atlanta (CBA) is a business coalition whose mission is to foster a healthy business environment by advocating a common business and civic agenda to policy makers as well as citizens. CBA is comprised of representatives from businesses and business organizations that are concerned about the future of Atlanta. The CBA seeks to articulate a common civic and business agenda in an effort to assist the policymakers for the City of Atlanta. 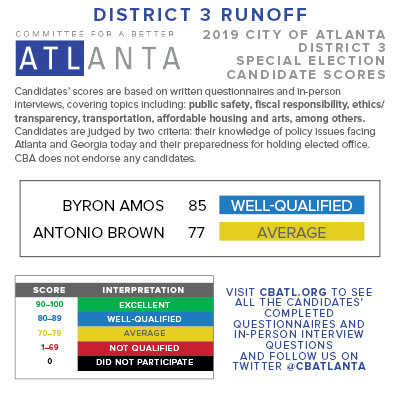 In addition, CBA provides voters with tools to assist in making informed choices by providing information on political candidates, including general qualifications and an assessment of each candidate’s understanding of and commitment to key issues facing the City of Atlanta. Need to register to vote? Click here.